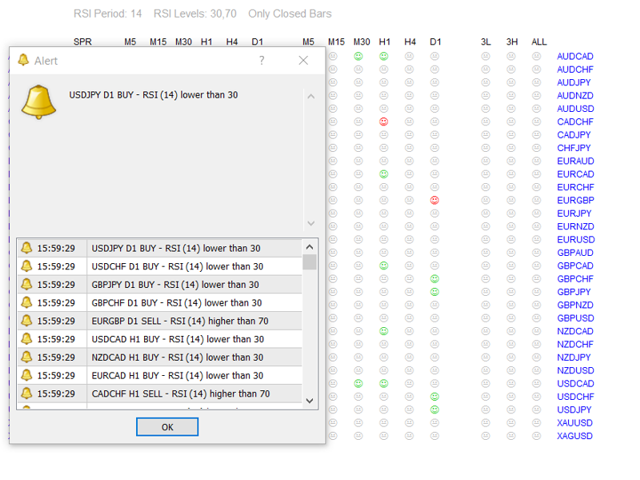 RSI Dashboard is a great tool for quickest possible analysis of multiple currency pairs in terms of Oversold or Overbought at the same time. This analyzer is perfect for alert notifications through the MetaTrader terminal, push notifications to mobile device and also email alerts, e.g. from a VPS. The most important parameters are period of RSI ("RSI_Period") and 2 levels ("RSI_Low_Level", "RSI_High_Level"), below and above which we will get alerts. For example, if you set RSI_Period=7, RSI_Low_Level=20 and RSI_High_Level=80, you will receive alerts when the value of RSI (for period 7) for a given currency pair and a given timeframe will be below 20 (oversold) or above 80 (overbought). Another parameter is "Use_Only_Closed_Bars" - if set to "True" alerts come only from closed candles. If set to "False" - alerts come immediately from current candles. c) M5 + M15 + M30 + H1 + H4 + D1 ("Alerts_if_ALL_TFs_coherent"). If we leave blank fields in these parameters we will get alerts without comments. In header of dashboard are displayed 4 actual parameters: RSI Period, 2 RSI Levels and text: "Real Time Values" or "Only Closed Bars" (depending on parameter "Use_Only_Closed_Bars"). Every color of RSI Dashboard is modifiable. Green - means that value of RSI is below RSI Low Level. Red - RSI is above RSI High Level. Gray - RSI value is maximal "Near_Level_Percent" points above RSI Low Level or below RSI High Level. We can set maximum spread at which the notifications will come ("Alerts_Max_Spread"). c) above 1.5 times higher than this parameter. I	suggest to make a new template with "RSI Dashboard" and scheme without	colors ("None"), only Background and Foreground set to "White". Remember, no one except yourself is responsible for any investment decision	made by you. You are responsible for your own investment research and investment	decisions. Can you please add the 1 minute timeframe and the various price types: close, open, high low typical median weighted? Thanks! 1. The number of displayed symbols is 30 and the name of each symbol can be edited in the parameters. 2. Every color in dashboard is modifiable. 3. Added possibility to adding comments to every type of alert. 4. Simplification in naming of parameters and description. 1. The possibility of setting two unrelated to each other RSI Levels ( "RSI_Low_Level" and "RSI_High_Level" - default: 30 and 70). Information about the both two levels is displayed in the header of the dashboard. 2. Added information in header of dashboard whether we use only closed bars or current bars to trigger the alerts. 3. Possibility of adding two comments to email alerts that work in two cases. "Oversold_Coment" works in the case of RSI oversold (RSI value lower than "RSI_Low_Level" - default comment: "BUY") and "Overbought_Comment" works in the case of RSI overbought (RSI value higher than "RSI_High_Level" - default comment: "SELL"). Comments in email alerts are embedded between timeframe and RSI period. 4. The possibility to choose whether the whole text of alert is in the body or in the subject of email messages ("Alert_On_Email_Subject", default alert text is in the body of email message). 1. Added possibility to set "Only_Closed_Bars" - if set to "True" alerts come only from closed candles. Of course, if set to "False" - alerts come immediately from current candles (as so far). 2. Added missing currency pairs. c) M5 + M15 + M30 + H1 + H4 + D1 ("ALL_TFs"). 2. Added title above dashboard with visible actual parameters "RSI Period" and "RSI Level".